Driving through Atlanta you'll see lots of interesting things...in every neighborhood. Driving down Clairmont Road, not too far from Peachtree Industrial Road, you might see this World War II vehicle (photo) sitting just inside the curb. Do not be alarmed...they're friendly. 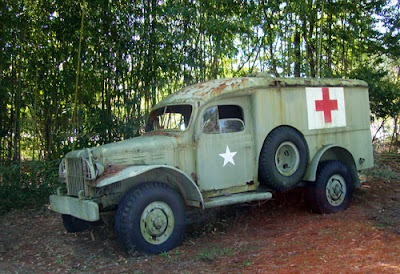 This mobile medical unit, and several other nearby vehicles, are part of the decor of the 57 th Fighter Group Restaurant situated on Dekalb Peachtree Airport PDK (for some reason sometimes called Peachtree Dekalb Airport). Interestingly, the restaurant's theme is World War II, but the location's history is more significant to World War I. On this day, April 17, the United States joined World War I and shortly thereafter, several military stations popped up, including one on what is present day Dekalb Peachtree Airport—Camp Gordon. Remember, when you're finished dining at the 57th, you can always go for an aerial tour of Atlanta!